To enhance and promote the use and enjoyment of the library. To raise funds to support library programs, services and to help fund items not generally covered in the library’s regular operating budget. 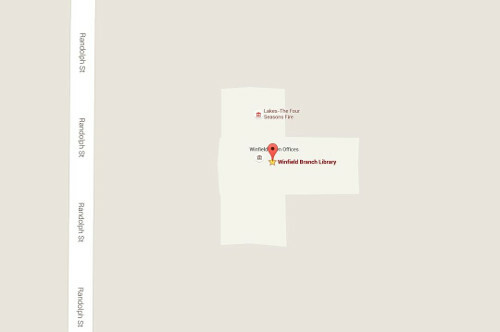 The Friends of the Crown Point Community Library annual Literary Luncheon is scheduled for Saturday, May 18 from 12 – 3 p.m. 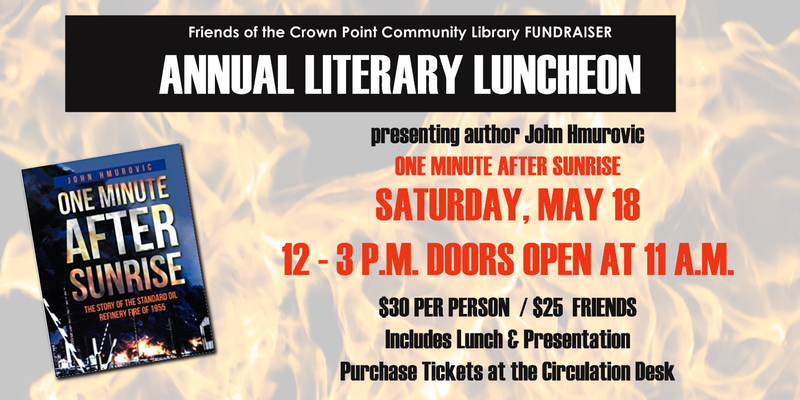 The event will take place at the Crown Point Library, and includes the presentation of One Minute After Sunrise, written by local author John Hmurovic, a box lunch, and raffle drawings for gift baskets. Tickets to the event are $30 per person or $25 for Friends members and include lunch and the presentation. Tickets are on sale now at the Crown Point Library. Books will be for sale and a book signing will follow the presentation. Whiting, Indiana – Saturday, August 27, 1955 – Sunrise, 6:11 a.m. It’s 80 degrees in the shade, and most of the city’s residents are still trying to sleep off an airless, oppressive night. But inside the plant at Whiting’s biggest employer (and one of the world’s largest oil refineries), something has gone horribly wrong…something that threatens to destroy the entire community. The clock changes. 6:12 a.m. This is the story of what happened at on that cataclysmic day in 1955, spoken in the words of the people who lived through it. It’s the story of how, in the passing of a single instant, their lives and their community were changed forever. 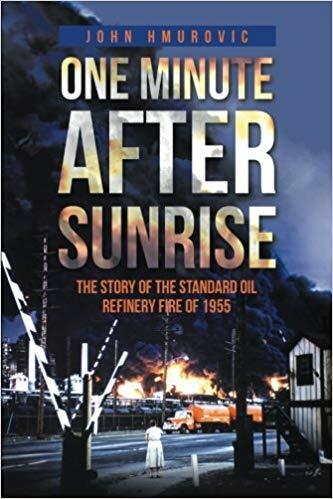 John Hmurovic, a native of the Robertsdale section of Hammond, interviewed over 80 people and combined extensive research to tell the story of what happened after the most spectacular American industrial accidents occurred. 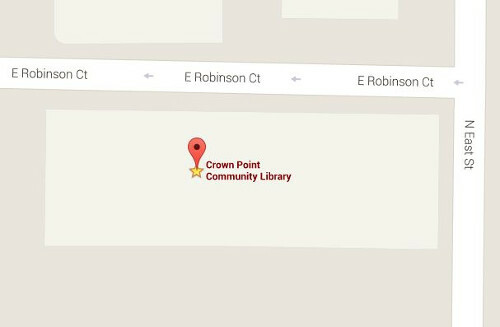 Visit the Library Booth at the City of Crown Point Festivals. The Friends have a mobile book sale at the Crown Point Farmers Market. Support the Friends this holiday shopping season! Go to smile.amazon.com and support Friends Of The Crown Point Community Library Inc. The Friends thank you for your support! The Friends of the Crown Point Community Library have supported special programs and help to purchase items not generally covered in the library’s regular operating budget. They have made it their mission to enhance and promote the use and enjoyment of the library. Many Friends volunteer by helping with the monthly and annual book sales, fundraising, and promoting the library. In addition to membership dues, money raised from the Literary Luncheon and book sales support on-going adult, children, and teen events, provide prizes for summer reading programs and help purchase equipment not covered in the general budget. As a member of the Friends of the Crown Point Library, you’ll be paid back in a thousand ways every year – with children’s smiles, the sincere appreciation of the library’s hardworking staff and the pure satisfaction of knowing you make a difference in your community! The membership form is also available in the library’s monthly newsletter “Check It Out” or forms are also available at the Circulation desk. Membership is open to all individuals and families who want involvement in the library. Members are encouraged to attend monthly meetings and to actively participate in the book sales, and other events and projects. The membership year begins on January 1 and ends on December 31. All dues are paid annually. Curious to see what the Friends are doing? Attend a meeting! Monthly meetings are held on the second Tuesday at 10:00 am. in Meeting Room 2. If you would like to volunteer at the book sale, or an upcoming event please fill out the form and we will contact you! 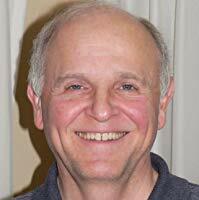 The Friends meet at 10 a.m. on the second Tuesday of the month at the Main Library, meeting room 2. March 12 - 6 p.m. This is our annual meeting and will take place at 6 p.m. instead of 10 a.m.
Get amazing deals at our book sales! The Friends provide over 1,000 new and gently used items monthly at rock bottom prices at their "ongoing book sale" held in the Crown Point Library’s Internet Cafe. Browse for all kinds of books, magazines, CDs, records, videos and more. You can discover new treasurers every day. All items are $1 unless marked otherwise. The Friends also host two larger annual book sales, in the spring and fall. There is no other place you can buy a bag of books for $5! Book donations accepted every day! Please donate your new or gently used items to the Crown Point Library location. For a list of acceptable items click here. Thank you for supporting the library and fulfilling your "need to read" at the same time!